I was aroused this morning at about 4 am by the loud sound of splitting wood. 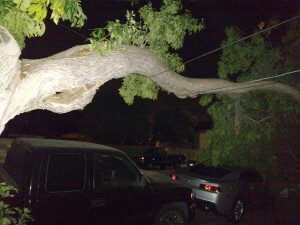 I knew right away what it was because nothing else sounds like that: A tree had lost a limb. After finding a shirt and some pants and plodding out the front door, I saw that one of the trees in front of my house had dropped a sizable branch onto the neighbor’s car. Also three telecom lines and a PG&E electric service drop. I called 911 and PG&E. There was no fire but it seemed like a situation that was at least somewhat of an emergency on account of the power line. What subsequently ensued was practically comedy. SJFD arrived first but they didn’t have anything to really do on account of there not being a fire. They boys made a good show of putting out orange cones and taking charge of the situation, which I certainly appreciate since I’m not exactly a take charge sort of person at four in the morning. Also it’s good that they were there since who knows, if the power line had come loose then things could have gotten much more exciting in short order. Which thankfully didn’t happen. All that being said, you have to kind of laugh at the situation when the fire department drives up and it takes them five minutes to work out how to turn on the flashing lights on their truck. They got it worked out in the end though. Thanks guys! The next to arrive on the scene was someone with the city. If the fire department didn’t really have anything to do, then the city guy had even less. I think the singular extent of his contribution was to tell me when the city tree contractor would arrive to take care of the downed limb. The answer was thirty minutes. My recollection is quite clear on this because I had the chance to ask him several times over a period of about an hour and a half, and the answer was unwaveringly that the tree guys would arrive in thirty minutes. 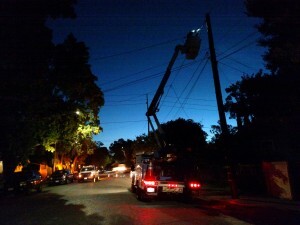 PG&E arrived shortly after the city. Theiy didn’t do anything though, because the guy who happened to be on call was with the natural gas side of the business and didn’t have the equipment to work on power lines. I guess they sent him just so that they could say, “yep, we’re here responding to emergencies quickly!” It’s not his fault, I’m sure he just goes where the dispatcher tells him to go. Just as the eastern sky was getting light the PG&E lineman finally got on site equipped with a predawn color-coordinated bucket truck. For those of you who aren’t out west, the monopoly power company here paints their trucks cornflower blue. He was efficient as all get out. 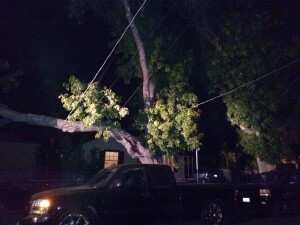 He disconnected the service drop, pulled the cable over the top of the downed limb and had it reconnected by sunrise. Then he and his buddy took off. While he was working the fire department had also departed, so the street was left to me, a few interested neighbors one of whom had a tree on top of his car, and the city guy reassuring us that the tree contractor would arrive in thirty minutes. They did eventually arrive, although if I’d known it would take so long I would have gone and picked up coffee and donuts for everybody. I’m not as irritated as it sounds about the tree crew, they probably got there as fast as they could and they did good work. I just think it’s silly that the city guy had to keep saying thirty minutes. I did get a chance to chat politics with the professionals while the time was passing. 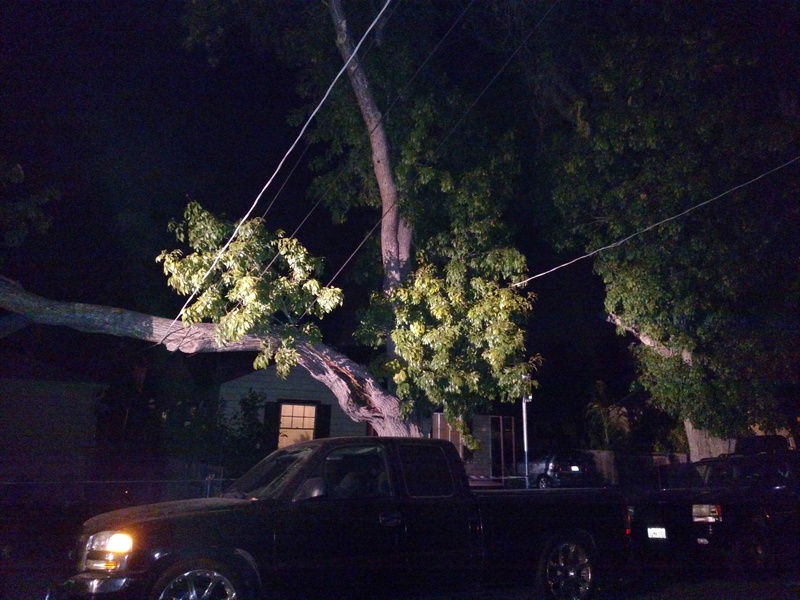 San José used to have our own tree crews, who were actually on call and available for emergency work. They even paid for the basic service out of tax revenue. That all changed when former mayor Chuck Reed went on his privatization spree and tried to bust up all the unions. He didn’t quite manage with the fire and police departments, but he did achieve annihilation of the city’s tree care capability. Now homeowners are forced to use the city’s approved private vendor for emergency tree services, who charges suitably high monopoly vendor prices, and we can’t price shop in what would be a free market. I know because I tried. The city doesn’t officially require that you use their vendor, but in practice because of the size of the contract with the city they are the only vendor around who is big enough to get a crew on site with two hours’ notice. And they charge whatever they want. This might all be a condemnation of privatization as delivering the worst of both worlds, and it is exactly that, but there could potentially be a silver lining if for example the big contractor were to cut costs so much that the crew they send out were to have no particular connection to the company itself. And if that were to happen then maybe, hypothetically speaking, the crew might see how ridiculous the situation is and offer to do a good deal of the work off the books at half the company’s rate on a cash basis. I mean, you know, that could theoretically happen. Anyway at the end of the day I’m down to one healthy tree in front of my house. I’m disappointed. Not in the crew or the fire department or PG&E or the guy the city sent out. I’m disappointed that I have only one tree. 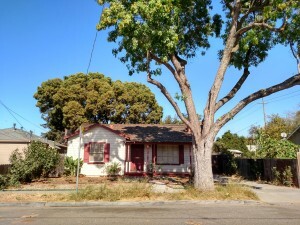 I really did love my big, pretty trees and they made me feel happy to come home to my little house even if it isn’t in a very good neighborhood. Today after everything was finished I went out for food and when I came back there was one solitary tree standing a lonesome vigil for me on the parking strip. It seemed so sad. It also made clear that my front yard looks more or less like crap. When I put in the bark and native plants to be drought friendly and low maintenance it seemed like a good idea, but they’re slow growing. It wasn’t so bad with a pair of trees to look at but now the empty space from the curb to the house seems awfully barren. I need something there which will become waist high in about a season or perhaps come that way from the nursery. Or maybe a little fence if that’s not too kitschy. Anything to interrupt the flatness.